Collin has been involved in the plumbing industry here in Baltimore since he was a child. As a teen, he started helping his father carry tools during summer break and then worked full time in the late 2000’s. Working for almost 10 years Collin began to feel called to military service and enlisted in the Marines in 2010. He served 2 deployments in Afghanistan as a 0311 Infantryman. Over the course of his service he was awarded both the Bronze Star and Purple Heart. After being medically retired from the Marine Corps, Collin chose to rejoin the plumbing industry as his family had been doing for 5 generations. 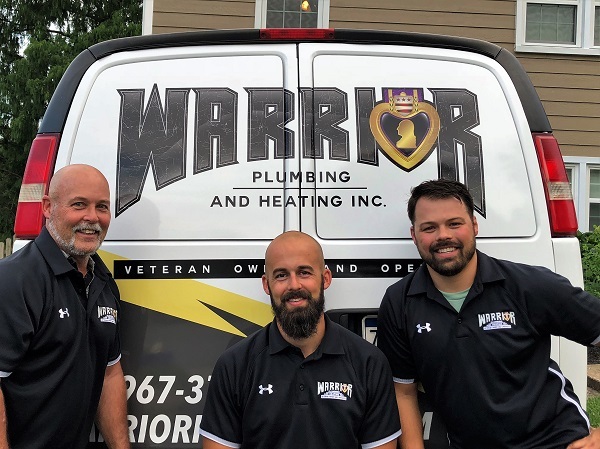 Since the founding of ‘Warrior Plumbing and Heating’, Collin has overseen its growth on a foundation of the honesty, loyalty, and trust. Brent is a 5th generation plumber and a dedicated family man. He has brought an irreplaceable asset to our team here at Warrior Plumbing and Heating. In addition to being a loving husband and father, Brent has a dual degree in business/economics and a Master Plumber/Gas Fitter License in the state of Maryland. He has been doing plumbing in Baltimore and the surrounding areas for over ten years. Brent strives to be the best at everything he does and is dedicated to serving his community and helping others. Better known as “Big Brent”, he has been in the plumbing industry here in Baltimore for over 40 years. Brent has built and maintained his plumbing business by delivering consistent high-quality service to his clients. This dedication to service awarded him “Baltimore’s Best” in 2010. Brent brings incredible knowledge and expertise to the team and is the heart of this organization. Brent always puts the customer first and always finds a way to deliver outstanding service. Warrior Plumbing & Heating is composed of a knowledgeable team of specialists who are here to help you when you need it most. We understand that plumbing problems are usually unexpected and an extra expense that you weren’t prepared for. We do offer financing options upon approved credit as well as special pricing for veterans. Give us a call today to learn more about our services and how they can benefit you. We at Warrior Plumbing believe in providing excellent plumbing services through our dedication to Honesty, Integrity, and Respect. But most of all we believe in giving back to the Combat Wounded Veteran Community. When you choose Warrior you choose to support wounded veterans in your community. Scheduling an appointment with us is easy! Simply give us a call and let us know what’s going on. We will then send our experienced plumbing contractors to your home or business where they will inspect the problem thoroughly and provide upfront pricing before completing any work. There is no job too big or too small for us. Call us now to see how our trusted team of specialists can help! Our main goal is not only to fix the problem but to help you avoid encountering a plumbing dilemma again because let’s face it – there is nothing more frustrating than clogged drains or overflowing toilets. You can rest assured our plumbers are organized and won’t leave a mess behind. Our team of contractors is certified, licensed, and professional. They can tell if your home is having plumbing issues and are more than happy to inspect your plumbing system.